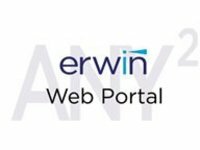 The erwin Web Portal provides a simple, customizable, web-based interface that allows both business and technical users across the organization to easily visualize the important metadata information that is stored in erwin Data Modeler and beyond. While only certain users will want to view or create data models, many more users need access to the information in those models, but would like this information presented in an intuitive and easily-accessible way. The erwin Web Portal allows easy access to information via the web, with a variety of presentation and search formats to cater to a wide range of user types in the organization. If you can use an internet search tool, you can use the erwin Web Portal. With a single keyword-based search, you can discover data assets that relate to your core business areas, such as "credit risk" or "customer". Queries can be "memorized" as links (URLs) which reproduce the results and may be shared with others (e.g., via email) to allow further analysis. The inter-relationships between data assets are a key part of the value of a data model. With the erwin Web Portal, you can view these interrelationships graphically, using the lineage analyzer tool. Uncover which tables are used by a given query, what columns are used by a domain, how conceptual, logical, and physical models interrelate, and other powerful analysis tools to assess the impact of change in the organization. A picture is worth a thousand words, and with the erwin Web Portal, you can easily see important data structures through intuitive visual models in various formats (including IE, IDEF, UML, and more). Powerful drill-down capabilities allow you to perform "what-if" analysis from these diagrams to drill-down into textual metadata details to uncover definitions, data structures, related queries, and more. Whether you are a business or technical user, the erwin Web Portal has an interface for you. Business users are provided with simple tools like internet-style keyword searches and visual analysis with just the right amount of information to keep it simple, while providing necessary and valuable insights around their data assets. Technical users are offered a wide array of search, analysis, and query options on the full set of technical data objects.